Microscope World Blog: How Does a Light Microscope Work? Ever wonder how a light microscope (also known as a compound microscope or biological microscope) works? This article explains in detail how a light microscope works. A compound light microscope gathers light from a small area (where your specimen is on the stage) and sends this light up through the objective lens. The objective lens magnifies the sample, as do the eyepieces you are looking through. In order to focus the image, the coarse focusing is used first in order to put the sample in the correct location to obtain a clear image. On light microscopes, moving the focusing knob will either move the stage up and down, or move the head of the microscope up and down. On the U2 biological microscope shown above, moving the coarse focus adjusts the height of the stage. On most high school microscopes, the focusing mechanisms moves the height of the head of the microscope. Once the coarse focus knob has been used to put the sample in the correct location, next the fine focus knob is used to fine-tune the focus and create a crisp and clear image. Light microscopes use a condenser above the light source in order to focus and direct the light up through the specimen (in a small beam of light) and into the eyepieces. Both the rheostat on the light as well as the iris on the condenser are used in order to get this beam of light focused properly when viewing the sample. The objective lenses can be rotated in order to change the magnification of the microscope. 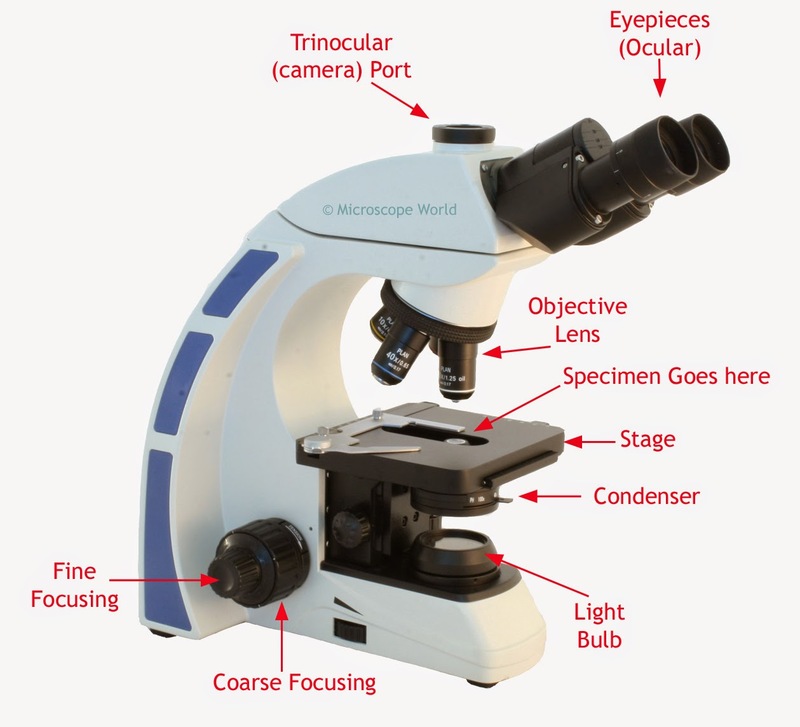 Most light microscopes utilize 10x eyepieces and this magnification is multiplied by the objective lens value to determine the microscope magnification. For example, when using the 4x objective lens (4x10=40x) the magnification is therefore 40x. If the objective lens is rotated to the 10x objective (10x10=100x) the total magnification becomes 100x. Light microscopes provide magnification up to 1000x. Any light microscope that advertises magnification above 1000x will be providing empty magnification and the images will not be clear or in focus.